France is a country of history, heritage, culture, and traditions. Every building, palace, monuments and even streets of the nation reflect the true essence of French culture, but it is exhibited in the beautiful museums in France, in the best way possible. All the museums in France are an incredible work of art that attract thousands and thousands of people from around the world. While some of them are known for their art and sculptures, other are praised for their 3D paintings and electronic display. A favorite of history buffs and archaeology enthusiasts, these museums are no less wonders than living legends of French past. The gorgeous museum of Louvre showcases art and sculptures by renowned artists of the World. Undeniably Louvre is no #1 in our list of most popular museums in France and one of the must-visit places to see in Paris. Located in the heart of the city, on the banks of River Seine, the mighty edifice of Louvre museum was originally a fort of the French army. Sprawling over 21,000 hectares, this museum is divided into different galleries like Egyptian, Oriental, Islamic, Roman, Greek, and British. Every gallery is endowed with marvelous collections of paintings, sculptures and artifacts of the ancient and medieval era. If you are an art lover, Louvre museum in Paris should be on the top of your bucket list. Key attractions: Monalisa by Leonardo da Vinci, Dying Slave by Michelangelo, Great Sphinx and Winged Victory of Samothrace. Opening hours: 9:00 am to 6:00 pm. On Wednesdays, the museum is open until 10:00 PM. Louvre is closed on Tuesdays. 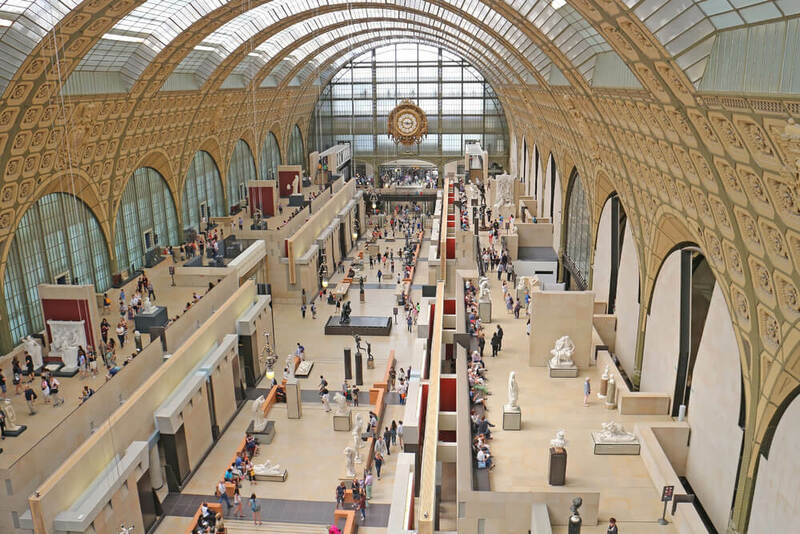 One of the famous museums in France, Musee de Orsay is another place of wonder. Displaying eminent artwork of Jean Auguste, Johan Barthold Jongkind, Berthe Morisot and Eugène Carrière etc, this age-old museum is a restored national monument and attracts a plethora of art and history enthusiasts, round the year. This is considered as one of the most charming places to see in Paris, France. Opening hours: 9: 30 am to 6 pm on all days except Thursdays, when the museum closes at 9:45 pm. The place is closed on Mondays. Entrance charge: INR 960/person. Entry is free for all on the first Sundays of the month. Reputed as the national military museum of France, Musée de l’Armée is located at the heart of Paris and was opened to the public in 1905. With 6 departments namely main courtyard and artillery collection, old armor and weapons, modern department, contemporary department, Charles de Gaulle monument and cabinet insolites, the museum exhibits objects and artifacts of the French army and allures travelers of all kinds. An array of weapons, armors, private uniforms, crown collections, marshals’ batons and ceremonial swords, displayed at various galleries of the museum, are the main exhibits other than paintings and archives of French war history. Key attractions: Dome church, Napoleon tomb and Veteran Chapel. There are few walks and tours but the interactive dome tour is the most famous among them. Dedicated to the French sculptor Auguste Rodin, Musee Rodin is another interesting museum in France. Housed in a vintage building, this museum features artistic décor and spacious galleries, displaying as much as 8000 paintings, 6600 sculptures and 7000 objects of art. In addition, the place also boasts of an impressive archive of more than 80000 old photographs. Moreover, Musee Rodin also has a dedicated gallery for the works of Camille Claudel. Surrounded by a luxuriant garden and a small lake; Musee Rodin is one of the best sightseeing places in Paris. Key attractions: Prestigious works of Auguste Rodin like The Thinker, The Kiss and The Gates of Hell. Opening hours: 10:00 am to 5:45 pm. The museum is closed on Mondays. Located in proximity to Place de la Concorde, this is another place of marvelous artwork display. Regarded as one of the quaintest museums in France, Musée Jacquemart-André houses famous paintings and sculptures of Henri Matisse, Picasso, Henri Rousseau, Alfred Sisley and Chaim Soutine. Key attractions: Eight water lilies murals by Claude Monet. Opening hours: 10 am to 6 pm. On Monday, the museum closes at 8:30 pm. If you’re traveling to Paris alone and wondering how to have an enjoyable time, then we’ve got you covered with this solo traveler’s guide. From trendy hotels, restaurants, and bars to the most invigorating museums and design markets, we have all the insider tips you need to make your stay memorable. If you’re young, single, and ready to mingle, then the bustling neighborhoods of Pigalle and Canal Saint-Martin are the place to be. It goes without saying that nothing helps lift the spirits of a lonely soul more than shopping for favourite books, clothes, films or antiques. Have a look at where you might find them in Paris at reasonable prices. No need to be concerned about safety. Paris will be absolutely teeming with tourists well into the night, especially in August. Plus the sun won’t set until around 9pm. Enjoy your time alone! Some go to La Coupole, the 87-year-old Art Deco brasserie in Montparnasse, to commune with friends; others, to dine with ghosts — Picasso, Piaf, Sartre, all former patrons. You can go alone, to live in the present.